1:30pm – Kart Lottery for Tony Karts. 1 Member from the team will select a number between 1-20 and go to the corresponding kart. You may begin applying decals and lights once your kart is back to your pit stall. 12:10pm - Grid Clear, 1 Mechanic w/ Kart, Driver to their positions. 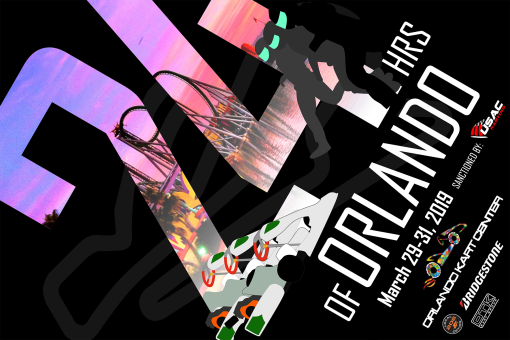 Rules & Track Map:Below you will find the 24 Hours of Orlando event specific rules. There will be a supplemental rule book added closer to the event. Also the track map will provide you with the available garage spots in addition to parking/spectating options. Bring a roller kart to the event. All rollers, must adhere to NKA 2018 rule book and come with CIK body work. Bring an extra set of wheels to be mounted with rubber depending on final tire compound. PMG Promotions will provide Briggs and Stratton Lo206 package, Fuel, and Tires. As well as timing and scoring equipment to be mounted to the kart. Hire a prepared 2019 Tony Kart to race in the 24 Hours of Orlando. There will be a shared mechanics for the Hire Karts who are there to assist you mechanical requests, or damages. PMG Promotions will provide Briggs and Stratton Lo206 package, Fuel, and Tires. As well as timing and scoring equipment to be mounted to the kart.